I love how the nativity scripture in Luke 2 evokes “the heavenly host” as an angelic choir singing, “Glory to God in the highest.” To me, this triumphant refrain favors a setting full of fanfare and majesty. So, fair warning, this piece is boisterous and bold, but (I think) appropriately fervent and (I hope) fun to sing—and play. Looking for the version with Flute, Violin, and Cello? A few of you have requested the “ensemble version” of this piece (with added flute, violin, and cello). You can download it here. I have a copy of the 2003 arrangement of Far, Far Away including the Flute, Violin, Violincello and 4-hand piano. Is there a separate music piece just for the instrumentalists (Flute, Violin, Violincello)? I don’t see this version on your website at this time, but I was hoping to perform this arrangement this Christmas and it would be so much easier for the instrumentalists to have their own sheet music. I LOVE your arrangements, they are so fresh and wonderful. BTW, the audio file associated with Far, Far Away is not the correct song. Thanks again and keep up the good work!!! Thanks so much, Brenda! I appreciate the kind words and support. I’ve just added the “ensemble version” of this piece to the site. You can get it here. The .zip file has all of the parts (separate sheet music for the instrumentalists). Thanks for letting me know about the audio file, too (now fixed). Good luck with the Christmas program! Hi Steve, your arrangement sounds best among other arrangements of this song I know. I would like to ask if it’s possible that you send us a copy of accompaniment only of this song? We are preparing a Christmas Devotional in our Ward however nobody can play the other part. I can play either the primo or secondo only however it might not sound good. Haha. In case you will grant our wish, you may send it to https://www.facebook.com/edloyo. Thanks a lot. We will announce your name during the program. Thanks so much for your comments. I’ve created a piano-only version of the accompaniment for your choir. Also, no need to mention my name or put it in the program—I’m happy to help! Good luck with your choir this Christmas! We sang this song for our Christmas program and it was excellent! It was the perfect way to celebrate the birth of Christ. Thank you for sharing this arrangement!! Turn this comment into a review. 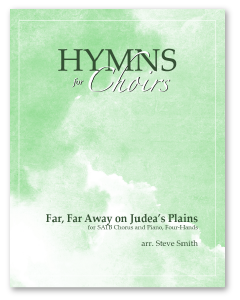 These FREE LDS Hymn Arrangements are just that—free for you to download and use with your ward or stake choir. If you use and enjoy these arrangements or simply wish to support free LDS music resources for ward choirs worldwide, please consider giving $2, $5, $10, or more today.